• What is the Board’s purpose? • What is the Board’s mission/vision statement? • What is unique about the board? • What websites do you like & why? • Who exactly are the customers of the Board? • How does the Board provide value to its customers? • What are the major features required on the website? • How will the Board measure success? • Do you have a style guide or any existing collateral? The Louisiana Uniform Local Sales Tax Board held its regular meeting at the LMA Building, 700 N 10th Street, Baton Rouge, LA 70802, on Thursday, May 17, 2018 at 10:00 am. The following board members were in attendance: Donna Andries, Greg Ruppert, Amber Hymel, Tiffani Delapasse, John Gallagher and Mark West (Proxy for Roland Dartez). Absent: Scott Richard and Mike Ranatza. • Motion by Tiffani Delapasse, seconded by Greg Ruppert to approve the Board minutes of the April 12, 2018 Regular Board meeting. Item unanimously passed. • Motion by Greg Ruppert, seconded by Tiffani Delapasse to approve the Board minutes of the April 27, 2018 Special Meeting. Item unanimously passed. • Motion by Tiffani Delapasse, seconded by Greg Ruppert to approve the Board minutes of the May 2, 2018 Special meeting. Item unanimously passed. • Motion by Tiffani Delapasse, seconded by Greg Ruppert to approve the Board minutes of the May 9, 2018 Special meeting. Item unanimously passed. • Chairwoman Donna Andries announced and welcomed the new Executive Director of the LULST Board, Roger Bergeron. • Motion by John Gallagher, seconded by Mark West to change the posted agenda to discuss Andrew Kolb, legal counsel for the Board, drafting a blanket resolution giving Mr. Bergeron the authority to act on behalf of the Board. The motion to add the agenda item was passed by a roll call vote with Donna Andries, Greg Ruppert, Amber Hymel, Tiffani Delapasse, John Gallagher and Mark West voting in favor of the addition. • A second motion was made by John Gallagher and seconded by Mark West to have Mr. Kolb began drafting the previously discussed resolution. o The resolution will be approved at a future meeting. o In the interim Roger will contact Mrs. Andries to approve items as needed. • Mr. Bergeron reported to the Board on the items he has approached since accepting the position.  Mr. Bergeron visited One American Place, however due to small offices and necessary advanced scheduling of conference rooms this may not be a viable option. It was also noted that based on experience of other board members this company was not the most compatible with the Board’s needs.  Executive suites had only two single offices available and no suites at the current time, however they do offer virtual office options. This building is located on Essen.  Mr. Bergeron has contacted a realtor for assistance and is planning on pursuing two other leads on the next business day. Mark West will also provide information to Mr. Bergeron via LoopNet, which shows all property for rent/lease within entered search parameters.  Mr. Bergeron was reaching out to members of the Sales Tax Institute in order to discuss having representation of the locals on their board. • The website has not been updated in a while and the members on the board did not have a “next meeting” scheduled date. However, Jeannette Pierre with the LDR did contact Mr. Bergeron and offer total cooperation of the LDR with the LULST Board in respect to local concerns when addressing Sales & Use Tax. • The STI is looking to recalibrate the Policy Rules in relation to sales and use taxes, so we will keep abreast of these movements. Also there is a post on the STI website that they will be addressing the definition of Moveable vs. Immoveable Property in the near future, which Mr. Bergeron will be monitoring closely.  Discussed possibility of hiring another applicant from the ED pool, JA Cline, to write policy and regulations for the Board. • Board vision and protocol of the Executive Director will be the first things that will need to be addressed by the individual engaged for these tasks.  Motion by John Gallagher, seconded by Mark West to add the agenda item to enter negotiations with JA Cline for contract services. A roll call vote was taken of Donna Andries, Greg Ruppert, Mark West, Tiffani Delapasse, John Gallagher and Amber Hymel with all in favor of the addition. • Motion by Tiffani Delapasse, seconded by Amber Hymel for Mr. Bergeron to enter into negotiations with Mr. JA Cline for his services on a contract basis to provide policy, vision, protocol creation and drafting. The motion was passed unanimously. 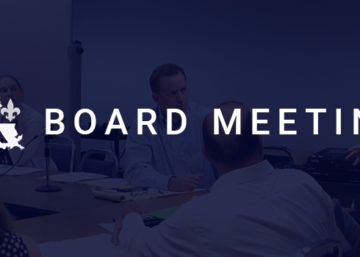 o Mr. Bergeron will present a proposal for the Board’s approval at the next regular meeting, which will include the requested rate per hour and number of hours needed for the position.  Mr. Bergeron will work in tandem with LATA to monitor all bills coming up in the upcoming special session. • Special attention will be given to the Streamline Tax Commission report that is due by EOY. o The Board would also note that the Multi Parish Audit Committee was only approached by one Business & Industry member to complete a multi parish audit. There was no other interest expressed in the option if offered at this time. • Mr. Bergeron’s role at the capital shall be to submit white cards during the sessions so the LULST Board has a voice. o White Cards are informative only. The Ethics Board will be approached to determine the actual guidelines the LULST Board should follow.  Mr. Bergeron was approached to complete a review of the local tax commission in St. Landry Parish before accepting the Executive Director position. Since accepting he has decline the request of the local government, however they wanted to know if the Board would be willing to complete the review or recommend someone to do so. The review would result in a report evaluating the structure & policies of the Collections Procedures, with a recommendation for future operations. • The Board decided against completing the review and will not offer recommendations of consultants in order to remain impartial.  A motion was made to open the public hearing on the proposed budget by Tiffani Delapasse and seconded by Greg Ruppert. The motion was passed unanimously. o The public hearing was opened at 11:19am. Public comment/discussion was solicited and not received.  A motion was made by Greg Ruppert and seconded by Tiffani Delapasse to close the public hearing on the budget. The motion was unanimously passed by the board. o The public hearing on the proposed budget was closed at 11:21am.  Tiffani Delapasse made a motion to adopt the proposed 2019 budget, which was seconded by Mark West and passed by the board unanimously. o The budget will be presented by Donna Andries to the OMV before the deadline of June 1, 2018.
o Mrs. Andries will also ensure the OMV is aware not to make any changes to the collection percentage without a request or approval from the LULST Board. • Donna Andries offered a substitute motion to authorize Mr. Bergeron to execute the agreement with MERS and any attached paperwork. This is due to the fact that the agreement in hand at the time of the meeting had incorrect wording included and the updated agreement would not be available until a later time. The motion was seconded by Amber Hymel and passed unanimously by the board. o The agreement effective date will be July 1, 2018.  The withholding would start on the date of May 14, 2018 to be remitted on the effective date of July 1. • Motion by Tiffani Delapasse and seconded by Mark West to add a request to approve the addition of Roger Bergeron to the signature form at Whitney Bank. o The motion was passed by a roll call vote as follows: Yays-Ruppert, Andries, Hymel, West, Delapasse, Gallagher. Nays: None. o A second motion was made by Tiffany Delapasse and seconded by Greg Ruppert to approve the addition of Roger Bergeron to the signature forms at Whitney Bank for the LULST Board’s banking account. The motion was passed unanimously by the board.  Request to approve the application for a credit card with the Board’s Whitney Bank Account in order to make purchases as needed and in order to participate in EBill with the accounting services. • The credit cards will have a $10,000 limit.  Request to approve a travel policy in accordance with current state travel policies.  Motion by Amber Hymel to apply for the credit card with a $10,000 limit, seconded by Tiffany Delapasse. Unanimously passed by the board.  Motion by John Gallagher, seconded by Tiffany Delapasse to adopt a travel policy in accordance with the State travel policy using the IRS mileage rate. Unanimously passed by the board.  Mark West motioned to enter into executive session to discuss current litigation with counsel. Tiffani Delapasse seconded the motion and the board unanimously approved.  The Board exited Executive Session at 12:35pm by way of a motion to exit by Greg Ruppert, which was seconded by John Gallagher and unanimously approved by the Board. Motion to adjourn at 12:36pm was made by Tiffani Delapasse and seconded by Amber Hymel and unanimously passed by board.